For the second year running our family team led by Katie Jackson and Jennifer Evans collected items to make Christmas Boxes for families affected by domestic abuse at Fortalice. Fortalice provides front line services inclduing a 22 bed refuge for women and children fleeing domestic abuse. 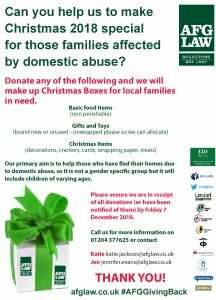 The demand for services is high and donations such as these help them to make this special time of year a more pleasant one, in what is often a difficult time for the residents and their children at Fortalice. Due to donations recieved, all the mums, children and young people in the Reguge received gifts on Christmas morning and it also enabled them to support a number of families who have recently left the Refuge where funds are already tight from setting up their new home. Thank you to everyone who helped with this appeal. Directors: G.C.French, A. Boardman, R. Khan, T.M. Vickers, C. Woolley, C.D. Fletcher, E.L. Cordock Consultants: D.M. Morgan.